Film Review: "Mr. Peabody and Sherman" (2014).
" You used time-travel improperly... we must rewrite history in order to save the universe!” Brace yourself for this as this is what’s going down in Mr. Peabody & Sherman. This American 3D computer-animated comic science fiction film based on the characters from the Peabody's Improbable History segments of the 1960s animated television series The Rocky and Bullwinkle Show. It is produced by DreamWorks Animation. Directed by Rob Minkoff (The Lion King (1994)), and executive produced by Tiffany Ward, daughter of Jay Ward, one of the creators of the original series. The film is the first DreamWorks animated film to feature characters from the Classic Media library since DreamWorks Animation's 2012 acquisition of Classic Media. The film centers on the time-travelling adventures of an advanced canine and his adopted son, as they endeavor to fix a time rift they created. The original cartoons are about Peabody, a beagle who is the smartest being in existence. Peabody has accomplished many things in his life as a business magnate, inventor, scientist, Nobel laureate, gourmand, and two-time Olympic medalist. One day, Mr. Peabody becomes sad and lonely and decides to adopt his own human son. In an alley, he meets Sherman, a dorky, glasses-wearing, orange-haired boy. After saving Sherman from a group of bullies, Peabody discovers that Sherman is an orphan and decides to adopt him. After a court appearance and a talk with the President and the government, Peabody becomes Sherman's new guardian. Together they embark on wild and educational time-traveling adventures where they encounter such historical figures such as Vincent Van Gogh, Leonardo da Vinci, Marie Antoinette, William Shakespeare, Ludwig van Beethoven and George Washington (just to name a few). The film features the voices of Ty Burrell, Max Charles, Ariel Winter, Stephen Colbert, Leslie Mann, Stanley Tucci and Patrick Warburton. The film is a whip-smart, consistently funny and good-natured film due to some terrific voice performances and one of the most hilarious appearances ever by an animated version of a living human being. Burrell gave a brilliant performance as the intelligently sophisticated and witty dog Mr. Peabody. Charles and Winter gave incredible performances that captured the essence of what it is to be children at that age, given that one of them was raised by an intelligent dog. Colbert and Mann gave hilarious performances. Tucci and Wartburton gave the most comical portrayals of their historical counterparts I have ever seen on film. 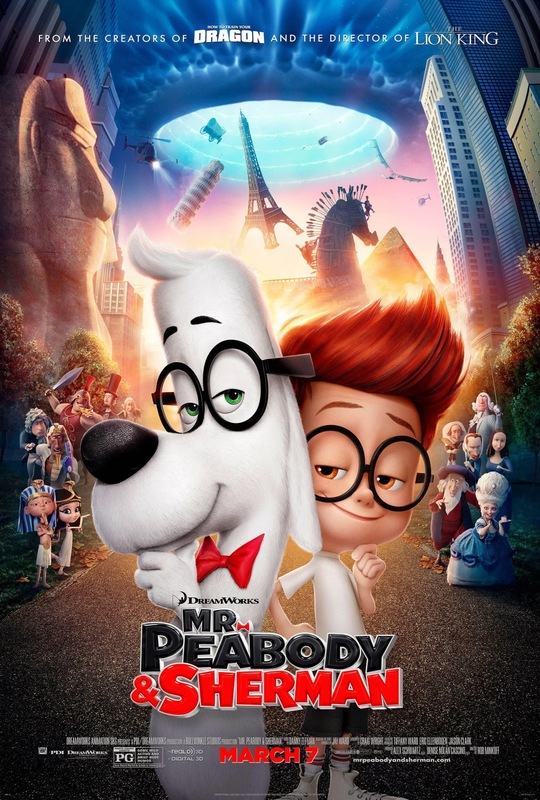 Rob Minkoff's Mr. Peabody & Sherman is a 3-D animated take on the classic characters that tries so hard, but its dazzling animation does not distract the audience from its dated source material and convoluted plot. The film may be a triumph of something — but it's certainly not the triumph we longed for. However the film offers surprisingly entertaining bursts of colorful all-ages fun here and there. To conclude, it’s nothing more than a eye-popping and touching yuletide toy of a movie. To an extent, this film is a case of style – and stylisation – overwhelming substance. “’ This is the end of everything isn't it?’ ‘The beginning. The beginning of everything.’” Which is what Noah is all about. This biblical-based epic film is directed by Darren Aronofsky, written by Aronofsky and Ari Handel, and is based on the story of Noah's Ark. 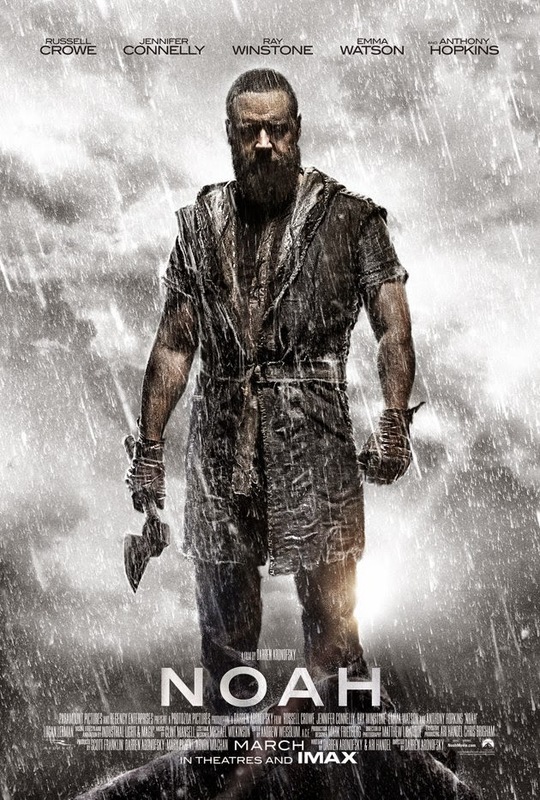 The film tells how Noah sees visions of an apocalyptic deluge and takes measures to protect his family from the coming flood by building an ark. Aronofsky first discussed Noah with The Guardian in April 2007, telling the paper that the figure of Noah had fascinated him since he was thirteen years old. Aronofsky explained that he saw Noah as "a dark, complicated character" who experiences "real survivor's guilt" after the flood. Aronofsky was working on early drafts of the script for Noah around the time his first attempt to make The Fountain (2006) fell through when actor Brad Pitt left the project. Ari Handel – Aronofsky's collaborator on The Fountain, The Wrestler (2008) and Black Swan (2010) – helped Aronofsky develop the script. Before they found financial backing for Noah, they collaborated with Canadian artist Niko Henrichon to adapt the script into a graphic novel. The first volume of the graphic novel was released in French by Belgian publisher Le Lombard in October 2011 under the title Noé: Pour la cruauté des hommes (Noah: For the Cruelty of Men). After the creation of the graphic novel, Aronofsky struck a deal with Paramount and New Regency to produce a feature film of Noah with a budget of $130 million. The film stars Russell Crowe as Noah, along with Jennifer Connelly, Ray Winstone, Emma Watson, Logan Lerman, Anthony Hopkins, and Douglas Booth. The performances in this film were brilliantly and superbly portrayed, especially with Crowe. Crowe gives a performance for the ages, a characterization that is ultimately a richly affecting, heart-wrenching yet ultimately redemptive one. In its remarkable settings and décor, including an overwhelming superstructure that is the ark from which the story is centered on, and in this dark, gritty and glowing picture—Aronofsky has worked epic wonders with Noah. The film hits the peak of Aronosky’s directorial efforts since Black Swan. Aronofsky's direction, in terms of conceptual audacity and meticulousness of execution, is similar to that of Stanley Kubrick. It’s vivid storytelling at its best, with the rise of the ark as the highlight of the film. However, whether it deals with biblical themes or even human themes, no matter now visually rich, the film suffers from its own unfocused ambitions. Its supporters admire the film's beauty and find it daring; its detractors find it overblown and hokey. For me, it is both these cases. It's difficult to swallow the amalgamation of Biblical, Buddhism, Taoism, New Age and even Atheism, all of these different religions tossed into one big stew. To conclude, it's a movie that's as deeply complex as it is visually striking. It is already set to be one of the year's most love-it-or-hate-it movies. Film Review: "Cuban Fury" (2014). The tagline of the film’s poster reads "All’s fair in love and salsa”, this describes perfectly what Cuban Fury brings to the dance floor! This romantic comedy film starring Nick Frost, Rashida Jones, Chris O'Dowd, Olivia Colman and Ian McShane. The film centers on a former teen salsa champion whose career was ruined, Bruce Garrett, is now a sad-sack engineer. But his passion for dancing is re-ignited by his crush on his gorgeous new boss, Julia, and he attempts to make a comeback. But the only way he can win her over is by mastering the art of dance. Now all Bruce needs to do is rediscover his inner passion (and lose 15 stone). The performances in this film were all brilliantly and hilariously portrayed. Thanks to the cast of Jones, O'Dowd, Colman and McShane. But mostly to Frost's performance and contribution behind the scenes as he conceived the idea for the film. The film rides on Frost, who carries it with charm, grace and plenty of heart. Frost on the dance floor was like a peacock on amphetamines. He struts like crazy. Nick Frost delivers one of the great physical performances of the year. Frost gets so far inside the role he seems capable of a human and dramatic note; even the dramatic moments are unerring. Though I thought the sexual innuendoes, between the characters of Frost and O'Dowd, was quite excessive but still managed to keep its lustre from becoming a pile of cliches. I enjoyed other dance films such as Billy Elliot (2000), Dirty Dancing (1987), Footloose (1984), Saturday Night Fever (1977) and Shall We Dance? (1996) so much. But Cuban Fury offers pleasures of its own. Five minute into the film and you know this picture is onto something, that it knows what it's talking about. The way the film has been directed and shot, we feel the vigorous pull of the salsa esque world, and the poppiness is transformed. These are among the most hypnotic salsa dance scenes ever filmed. At its best, the film gets at something deeply heartfelt: the need to move, to dance, and the need to be who you'd like to be. The film rocks to an exhilarating beat. However, it’s a tired and relentlessly predictable story of love between a man who is desperately trying to impress the woman of his dreams, who is way out of his league, with salsa dancing. It's not a bad gimmick, but the movie turns tediously sentimental fast. If the ending of the film is too neat and inspirational, the rough energy of the film's song and dance does carry one along, past the whispered doubts of better judgment. To conclude, there's nothing groundbreaking in the film, but it's a pleasant diversion starring the always amiable Nick Frost, with Chris O'Dowd relishing his role as a slimeball. If the film launches Frost into bigger and better films, it's worth it.